I have a love/hate relationship with my whiteboard. When I’m feeling euphoric, I set monthly goals and post them in bright colors. I prioritize items by number, artistically highlight tasks and link thoughts with arrows. My relationship is soaring. There is purpose, direction and the hope of progress. My heart is surrounded with feelings of love and joy and I am dancing with potential. Each time something is completed, I celebrate the success by drawing a single line through the task. The list remains long, but the view reminds me of how far we’ve come. When I’m pressed for time, stuck on a project, avoiding items near the top of the list and realize that half a month has passed, depression begins to creep in. We are no longer in sync. Each glance begins to crumble my confidence. I become uncertain and wonder about the future. A cloud of impending doom hangs over my head and tasks begin to feel like everyday work. Sometimes I take a break from the relationship and go days without contact. Sometimes I confront the issues, hash out the problems and rework priorities. Other times, I just wipe the slate clean and start afresh with a brand new color. It’s a good thing my whiteboard has no heart, because I am an unfair partner. The relationship is truly all about me. I only share my wants, needs and desires. I prioritize only according to my wishes. And when I’m in a funk, I put it aside, only willing to deal with it again when I’m ready to face the relationship. Is it worth it? Absolutely—at least from my perspective. Although there are many ups and downs, it is my motivation. It reminds me of who I want to be, helps me look at myself from all angles, and speaks truth. 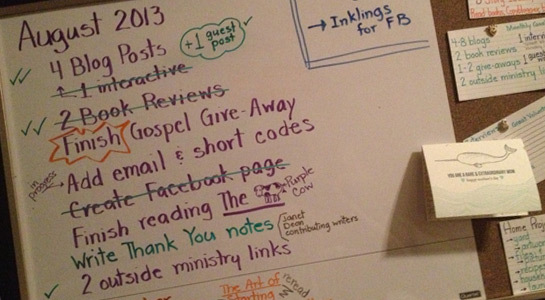 I am a better person because of my whiteboard…as long as it hangs there and doesn’t say a word! That’s a total of 50 square feet of whiteboard. I like them, but sometimes I think they look at me with judgmental eyes. Update: I have a new office configuration with 4 white boards now. A total of 66 square feet!